I love sleep masks. Anything that will take skincare to the next level and let me sleep and get results that I need overnight. Many companies have "overnight skincare masques" that allow your skin to get the care it needs while treating it and doing all of this while you sleep. Exuviance just came out with one. It is called the Overnight Recovery Masque. This mask helps you sleep away the day's damage: pollution, UV exposure, extremes of temperature and humidity, with an Anti-Pollution Complex in a luxurious sleep masque. 100% of people who used this reported smoother skin texture after 4 weeks of nightly use. It contains an Anti-Pollution Complex that includes antioxidant Lilac Cell Culture Extract and PHA/Bionics to help neutralize the effects of daily pollution and environmental damage on the skin. Prodew® refills deep reserves of natural skin moisture, restoring a feeling of suppleness and comfort. PHA/Bionics and Evening Primrose Oil strengthen skin's natural protective barrier. The unique water-gel sleep masque melts into skin and is suitable for normal, combination, dry, or vulnerable skin types, basically any type of skin that is in need of repair. Every day, skin is exposed to the damaging effects of the environment: pollution, UV exposure, temperature and humidity. Now you can help sleep away daily damage and wake to beautiful, revitalized skin. This water-gel masque melts into skin to attack the damage from everyday factors that can age skin. A potent Anti-Pollution Complex, including antioxidant Lilac Cell Culture Extract and PHA/Bionics, helps neutralize the effects of pollution and environmental damage such as free radicals and harmful metals that can break down collagen and prematurely age the look of skin. Prodew® refills deep reserves of natural skin moisture NMF (Natural Moisturizing Factor), restoring a feeling of suppleness and comfort. PHA/Bionics and Evening Primrose Oil strengthen skin’s natural protective barrier for a stronger, more resilient skin tomorrow. Suitable for normal, combination, dry or vulnerable skin types. The key ingredients in this mask are Gluconolactone, Lactobionic Acid, Prodew®, Lilac Cell Culture Extract and Evening Primrose Oil. Question: Do we really need protection in areas that are not extremely polluted? Yes! The Exuviance Anti-Pollution Complex delivers important benefits for all skin types, in all geographies, irrespective of actual pollution levels. The main form of pollution the skin suffers from is ultraviolet light, which has become stronger since the ozone level has become depleted. This complex helps to protext against free radicals that are generated from UV rays and also offers protection against metals, which can be found in drinking water/washing water. Another component of the Anti-Pollution Complex helps to builds skin's natural moisture barrier function to keep harmful elements out of the skin. It also maintains natural hydration by reducing water loss. Use the mask at night and make sure to follow with a moisturizer to seal in the masque benefits and maintain surface hydration. After cleansing, smooth across the face and neck, massaging very lightly to allow masque to melt into the skin. Wait 5 minutes as powerful ingredients absorb. To seal in the benefits of the masque, follow with your usual nighttime moisturizer. Leave on overnight. Rinse in the morning and follow with regular morning skincare routine. Can be used 2-3 times a week or whenever skin feels stressed. 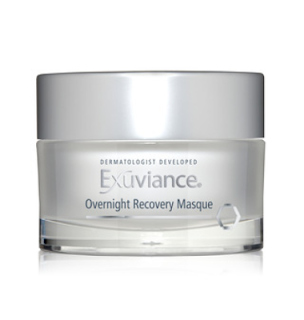 The Exuviance Overnight Recovery Masque is $65.00 and is available from www.exuviance.com, www.dermstore.com, www.ulta.com and www.skinstore.com. Exuviance is one of the brands that is under the NeoStrata Skincare company. Like NeoStrata on Facebook: https://www.facebook.com/NeoStrataCompany; Follow NeoStrata on Twitter: @neostrataskin; Follow NeoStrata on Pinterest: https://www.pinterest.com/neostrata/; Follow Exuviance on Instagram: https://instagram.com/exuviance/; Follow NeoStrata on YouTube: https://www.youtube.com/channel/UCf_jdb_vpqIWkgUcNRHIWIA; Follow NeoStrata on Google+: https://plus.google.com/+NeostrataIncPrinceton.